The TEDxSantaCruz Team received approval from TED to offer a workshop for the Greater San Francisco Bay area TEDx organizers. Local TEDx organizers were invited to participate in an exciting, productive and creative day where organizers shared the innovative things they have done with their TEDx events. The workshop was held on July 27th and there was also an early evening mixer hosted by Santa Cruz based non-profit, the Firelight Foundation. We were excited to have two of the finest organizational consultants in the S.F. Bay Area volunteer to facilitate the day. The facilitators are Peter Gaarn of The Piras Group and David Sibbet, President & Founder of Grove Consultant’s International. Both Peter and David have over 30 years of experience each in working with a wide variety of businesses and organizations. The findings from the event are covered in an illustrated workshop report created by Peter and David. 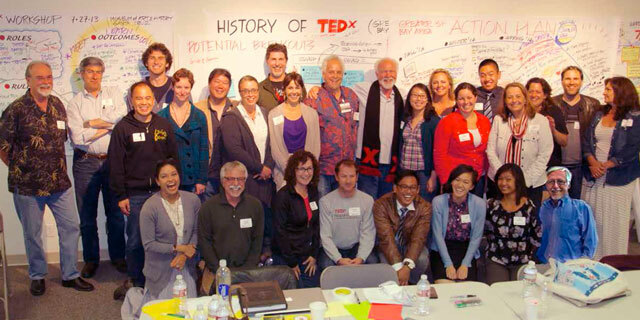 Don’t miss this great document, filled with ideas and information about TEDx events throughout the Bay Area. If you have any questions about the event, please don’t hesitate to contact david@tedxsantacruz.org. What have we done and what are we most proud of?